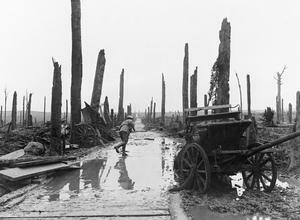 Assault on Passchendaele 12 October 1917, Frank Hurley. Image courtesy Imperial War Museum © IWM (E(AUS) 1233). The First Battle of Passchendaele took place in the Ypres Salient of the Western Front on 12 October 1917. Part of the Third Battle of Ypres, the offensive aimed to seize the Passchendaele Ridge from the defending Germans. The assault was ill-fated from the outset, with inclement weather, misinformation, delays in communication and lack of preparedness contributing to a failed objective. The Australian Third Division and the New Zealand Division spearheaded the offensive, with the Australian Fourth Division in support. Steady rain started falling in the lead up to the attack and confusion ensued when German artillery attacked part of the 3rd Australian Division before the battle started. The paltry Allied artillery barrage offered no protective to the advancing infantry, who were forced to press forward in the quagmire – at times waist deep – armed only with grenades, rifles and light machine guns. Forward patrols managed to reach the village of Passchendaele, but were unable to hold it, and were forced to retreat to their starting point. The assault ended in total failure, with all attacking units retreating almost to their original position. The New Zealand Division suffered more than 3,700 casualties as they ran into unbroken German wire at Bellevue Spur and fell victim to German snipers. Casualties that day included some 960 men killed or mortally wounded; the rest succumbed to their wounds in field ambulances and hospitals behind the lines in Belgium, France and England. 12 October 1917 would become known as the blackest day in New Zealand military history. The Australian Imperial Force lost 4,000 men during the First Battle of Passchendaele; the month of October 1917 would prove the worst month for Australian losses of the whole war, with 40,498 men killed, wounded or missing in action. This entry was posted on October 12th, 2017.